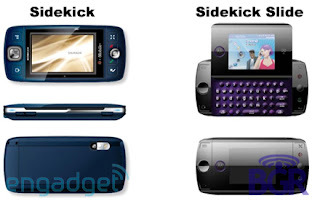 So what we have here are images of the Sidekick Slide (thanks Engadget) and what we believe is the Sidekick Zante, also known at the Motorola Q700. 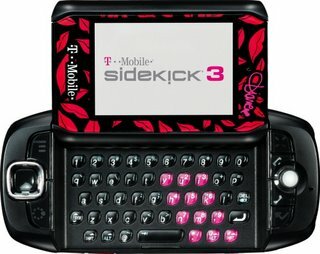 So while all these new devices and what about the Sidekick X and the Sidekick 4? We don't know just yet, but for now it appears there are two new Sidekicks on their way and they stem from a partnership Danger has established with Motorola (didn't we mention that 6 months ago?) A while back, there was rumor of a Sidekick RAZR coming, my guess is this is what people were talking about. Either way, get excited kids because these form factors look really slick. 1) Who is going to buy it? 2) Does Danger know that its probably time to move on to a higher resolution screen for 2007? 3) What part of the world buys phones in 'giggly' blue, fuchsia and 'turn off the neon' yellow? 4) Is this the final death blow (apologies to Mortal Kombat) to Danger Inc? The Sidekick ID has finally been found in the wild. 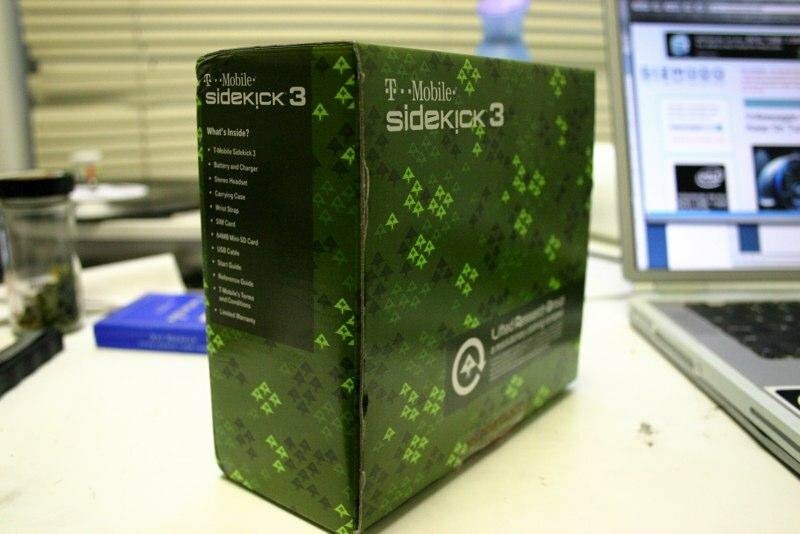 T-Mobile is set to release a trimmed down version of the Sidekick, named the Sidekick ID. 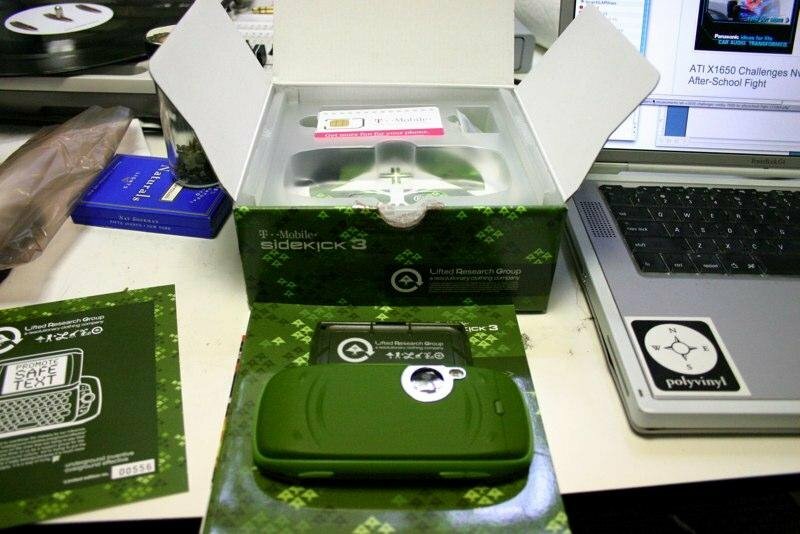 The Sidekick ID (SKiD) is lacking many features of the Sidekick 3, but what it lacks in features, it makes up for in price. It's estimated to be 1/2 the cost of the SK3, starting at $99 with 2 year service agreement. 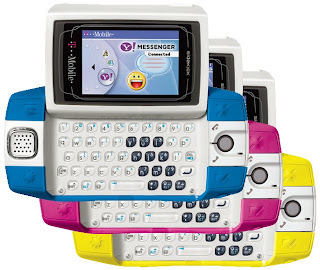 It still has instant messaging (AIM, Yahoo!, and MSN), email, web browsing, and the very familiar Sidekick interface. 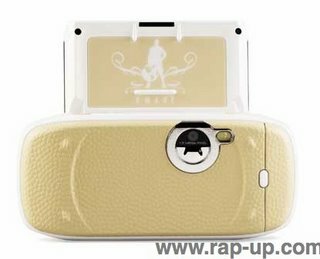 Features cut include Bluetooth, MP3 Player, digital camera, and a microSD slot. Expect to see it in June. Rolling Out Myfaves: The latest update for the Sidekick 3 has begun hitting today and one of the features includes the myfaves application. Other updates include picture management and texting letter count. A Gartner report came out today ranking the top PDA sellers. And guess what they said? 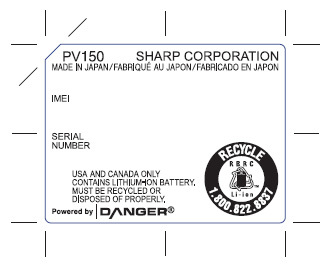 "Sharp ranked fifth in 2006 with 1,438,218 million PDAs shipped. with fewer than 30,000 shipped in 2006." I have to imagine most of these were Sidekick 3s right? but the lions share had to the old 3. 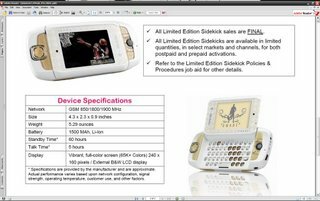 I have noticed the Sidekick 3 getting some extra lovin' on the front page of Ebay recently and when I saw it again tonight I had to post it so everyone could see it sitting there so pretty right next to the world famous Nano. Sidekick 3 wins the placement contest though at the top and to the left! Dwayne Wade. The guy is a true baller. And now the man is getting his own Sidekick 3. Check out the colors and the personalized logo. Not sure if it will have any special apps in it or not, but check out the picture off the sweet colorized Sidekick 3 on the left from rap-up, it looks like the paint job is done in a basketball style. Maybe it will make it easier to "grip." Are you a buyer? New Sidekick to Launch in the Spring for FREE! The FCC has approved a Sharp device going by the model number PV150 that we understand is a new form factor Sidekick that will launch in the Spring with a great low end price: free! How will it be free you ask? The carrier will subsidize the price of the phone and make up the money with the data plan required to take advantage of the Sidekick's messaging, email and web surfing features. What is the catch? This version will not have bluetooth. It will however be a tri-band (850/1800/1900) GSM device. It looks like Danger is trying to build its user base. 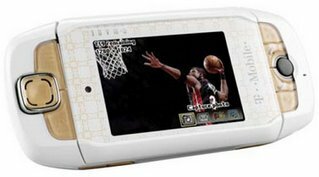 Word from T-Mobile is lots of people buying the Sidekick 3, but lots of people are turning it off too and moving away from the platform. Maybe this is a defensive move against the forthcoming iPhone from Apple and an attempt to build a subscriber base. 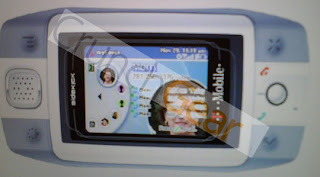 Sidekick Patent Might Hint At Razr-like Sidekick 3 or Sidekick 4? This is a patent from Danger filed some time ago. It might hint at the Sidekick 4, which I believe to be an ultra-thin profile Sidekick much like the RAZR or most of the new Handsets hitting the market. Notice the directional pad on the right hand side. This is the unofficial list of upgrades that come with the next OTA. Correction to the battery level indicator. Correction to battery charging icon. Previously the icon displayed charging even when th battery was fully charged. The OTA fixes this. Previously the device might have had problems with powering on when the power button was used to power off. The OTA fixes this. Previously, the clicking DONE in the address book will not save/close an address book edit. The OTA fixes that. Som beeps in the sounds profile did not also flash the trackball. OTA fixes. OTA will ensure that redialing occurs when button on headset is pushed after busy signal. Added Menu + Cancel shortcut in Music Player to remove menu item in playlist editing menu. Media Player used to be case sensitive when sorting playlists. After OTA, it is not case sensitive when sorting alphabetically. OTA will allow deletion of multiple selections from a playlist. Device locking up after going to “sleep”. OTA fixes that. Fixes echo in Speaker mode. Battery Cover Notification is noticable when keyguard is activated. Well, here it is. The first pics of the Special Sidekick 3 LRG edition. Thanks to Gizmodo for the sweet, high res pics. 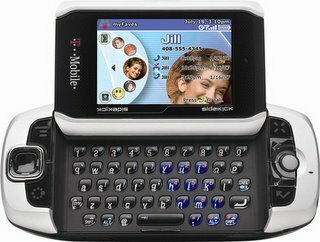 The Sidekick 3 actually looks sharp in color. "...let's get into the delish doings at T-Mobile's Sidekick 3 Soiree at Mr. Chow. All the bash babes, including reunited duo Paris Hilton and Nicole Richie , are feting the launch of limited-edition Sidekicks, designed by Diane von Furstenberg (hot lips for the babes) and Lifted Research Group (army green for the boys). And there's more than one sidekick out tonight. I'm talking about Lindsay Lohan 's latest second in command, Rumer Willis . Hey, it's about time we got a new girl-about-town, don't you agree? Read on, and let me know what you think by posting your comments! Celeb to Civilian Ratio: 1:2 It's a full-time job tracking the moves of the fierce foursome of fetes: Paris, Nicole, Lindsay and Mischa Barton . Each girl and her posse settle into the VIP leather booths that circle the rose-draped, pink-hued space. "It's only 10, and we've already had to close the list because it's too crowded," confides one of the security goons. "As of now, only celebs are getting in!" 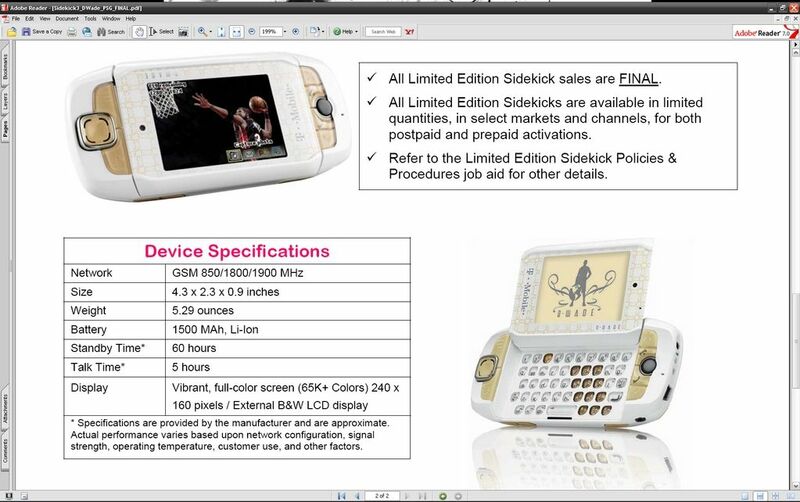 Here is another special edition Sidekick 3 by Diane Von Furstenberg that will available for pre-order at the end of the month. I like all of the little kisses, reminds me of a girl I used to date. Those pink number keys are sweet too. Stay tuned for more details.